Michael Rosen received his undergraduate degree in Chemistry and Chemical Engineering from the University of Michigan, and subsequently spent a year in Alan Battersby’s lab at the University of Cambridge as a Winston Churchill Foundation Scholar. He then came to Harvard University for graduate school in the Chemistry department. In Stuart Schreiber’s laboratory Rosen worked in understanding the molecular basis of receptor-ligand interactions by studying the structure and function of immunophilin FKBP12, which binds the immunosuppressant FK506 protein. After his PhD, Michael joined the laboratories of Tony Pawson and Lewis Kay at the University of Toronto to study the regulation of the signaling adaptor protein, Crk, and developed methods to selectively label protein methyl groups, thus advancing the field of NMR spectroscopy. Rosen then joined the faculty at Cornell in 1996 where he began his work on understanding molecular regulation by Rho GTPases. He moved to UT Southwestern in 2002 and became a full professor and an HHMI investigator in 2005. Rosen’s lab has taken a multidisciplinary approach to detail the mechanisms by which Rho GTPase signaling controls the dynamic organization of cytoskeleton. Currently his research focuses on understanding the mechanisms by which the properties of individual molecules (organized in Angstrom-length scale) give rise to cellular architectures, which are organized in micron length scales. To achieve this, his lab studies the fate and dynamic response of individual actin filaments to upstream signals, and how they lead to organization of higher-order assemblies to produce the micron-size structures. Rosen is the recipient of numerous awards, including the Beckman Foundation Young Investigator Award, the Kimmel Scholar Award, the Edith and Peter O’Donnell Award and the Presidential Early Career Award for Scientists and Engineers. 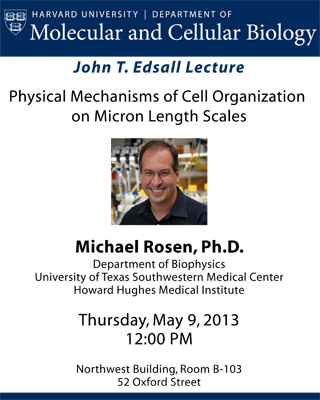 Rosen also holds the Mar Nell and F. Andrew Bell Distinguished Chair in Biochemistry at UT southwestern.